Advertisers have a challenging job of increasing recall and improving resonance with consumers. That is where promotional products, branded gifts, and giveaways shine. Perhaps that is why promotional products have stood the test of time through the technological advances in advertising. This article will take a look at how promotional products fit in with the modern consumer and still do a very effective job when it comes to helping advertise your business. The statistics and information in our article come from a 2017 research project as part of the Get “In Touch!” campaign. The research was conducted by the Promotional Products Association International (PPAI) and was posted on the British Promotional Merchandise Association (BPMA) website. The statistics prove just how important branded gifts and merchandise with your company logo on them can benefit your advertising and marketing mix. The study uses key metrics to evaluate the value of the promotional products and how they compare to other advertising channels. The five key metrics that were used to assess the value and weight of options used by survey responses regarding each promotional product component: reach, recall, resonance, reaction, and relativity. 28% of consumers say they are exposed to promotional products most of the time each day; however, the average millennial says they are in contact with a promotional product all the time. 81% of consumers keep promotional products for more than one year. 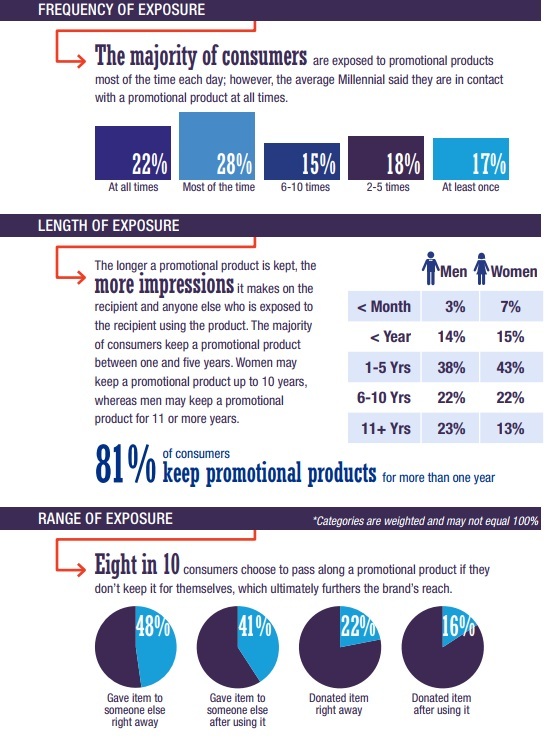 Eight in ten consumers choose to pass along a promotional product if they don’t keep it for themselves. 83% say they recalled at least one brand. 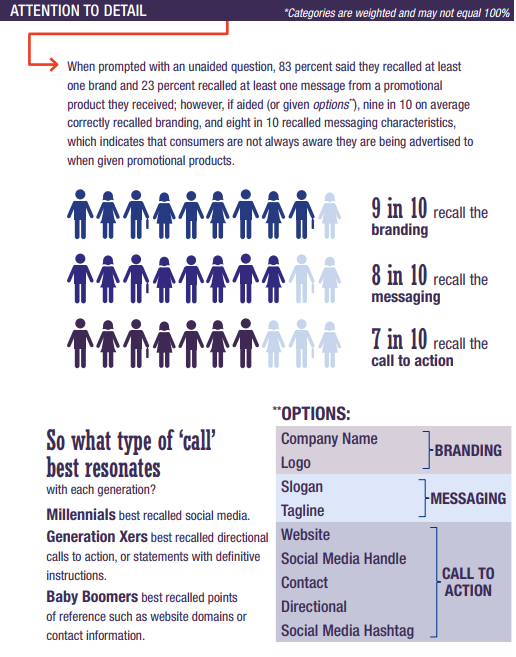 23% could recall at least one message from a promotional product. 9 in 10 recalled the branding. 8 in 10 recalled the messaging. 7 in 10 recalled the call-to-action. What type of recall best resonates with each generation? 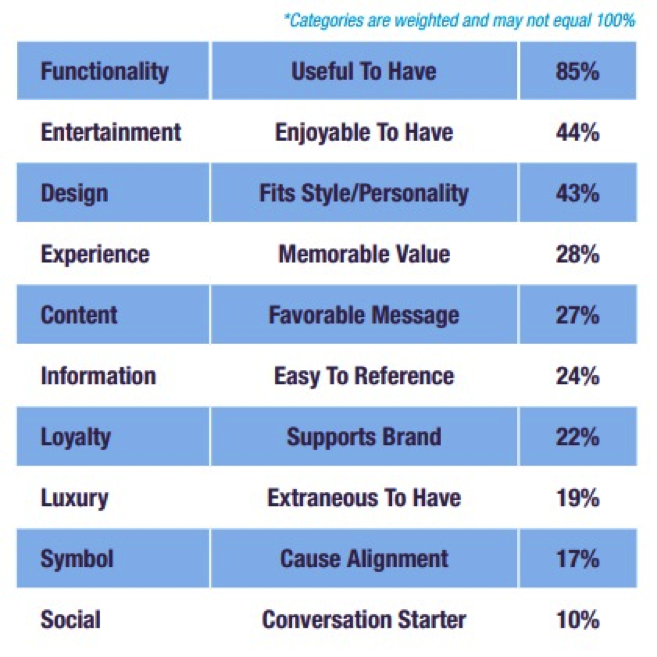 Millennials best recalled social media. Gen Xers best recalled directional calls-to-action or statements with definitive instructions. Baby boomers best recalled points of reference such as website domains or contact information. 82% of consumers agreed that their impression of a brand positively changed as a direct result of receiving a promotional product. 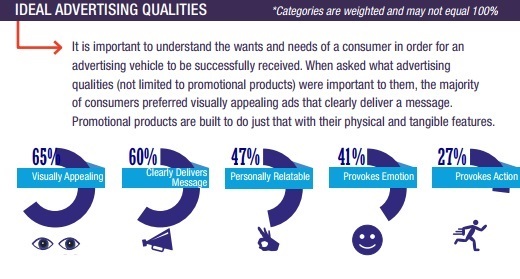 79% of all recipients said they have looked up a brand after receiving a promotional product. 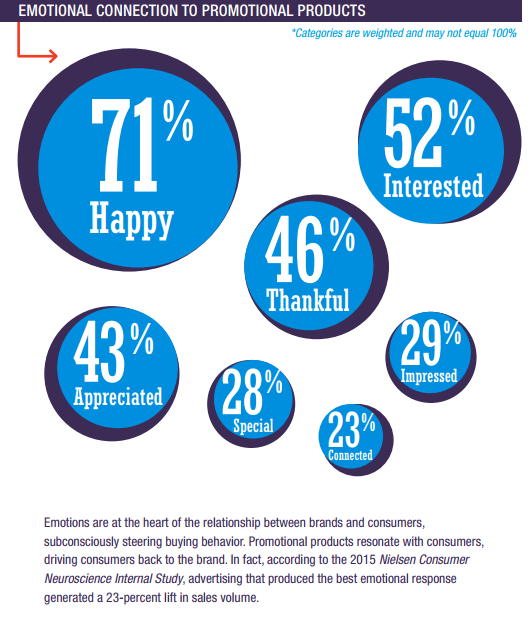 87% of Millennial recipients looked up a brand after receiving a promotional product. 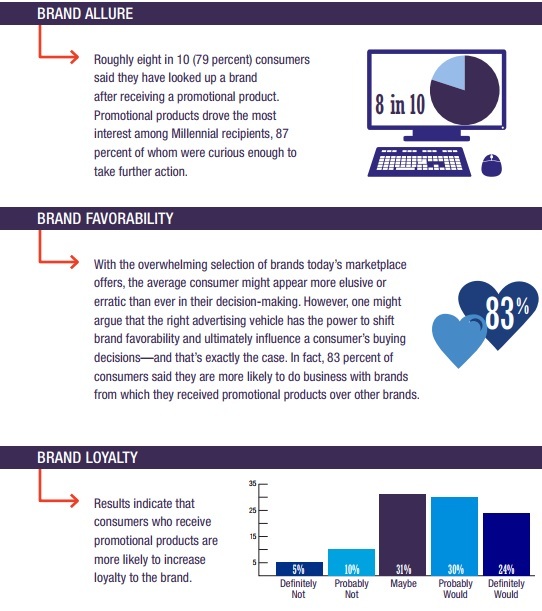 83% of consumers said they are more likely to do business with brands from which they received promotional products over other brands. Relativity is heavily relied on by many brands today as part of their overall advertising strategy and it helps companies determine where to invest their ad spend and make data-driven decisions. Promotional products stand out as the consumer’s choice in-brand communication and there are many opportunities to ensure that the promotional product you choose for your company is relative to your brand and aids with the other four aspects. As you can see, they all tie in together. 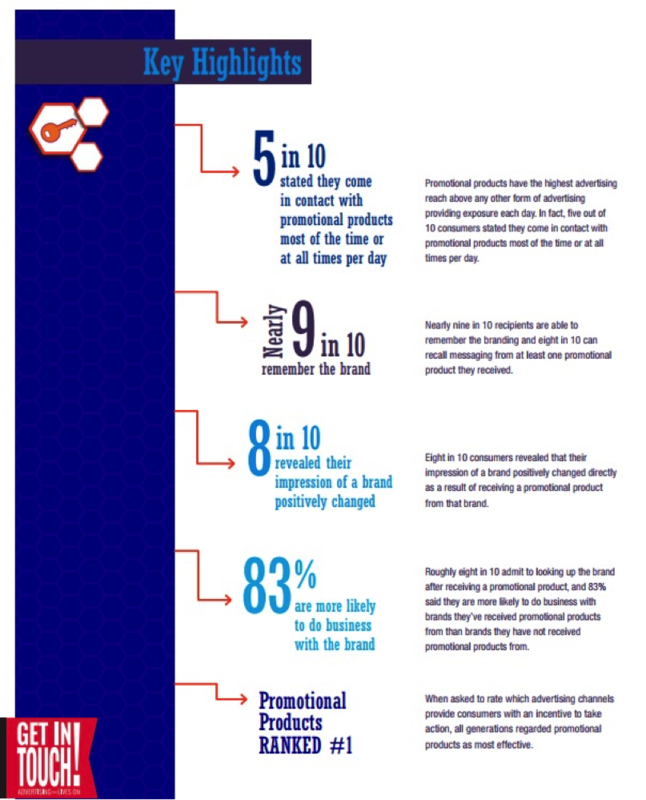 Promotional products are the most effective advertising channel. 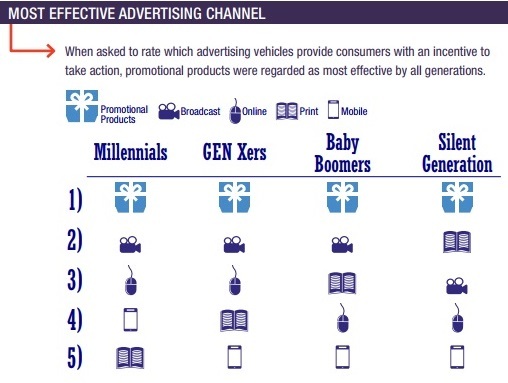 They are regarded as most effective by all generations when asked to rate which advertising types entice consumers with an incentive to take action over broadcast commercials, online advertising, print, or mobile ads. It is important to understand why a recipient chooses to keep a promotional product because that provides insight into what is valued most. This is vital since promotional products are not only meant to simply convey a message, but to bring a value and connect with recipients. As you can see, promotional products can be very beneficial advertising platform when it comes to all five areas of reach, recall, resonance, reaction, and relativity. 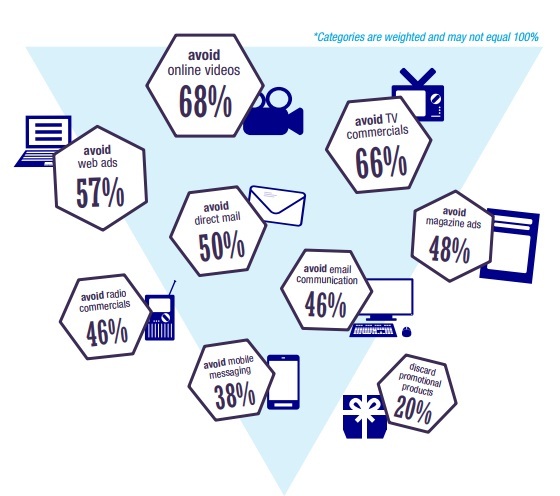 The key highlights of the report findings below are a great summary of some of the best statistics from the research report findings which provide an excellent insight into consumer opinions on advertising and promotional products. The best thing is that you can test a promotional products campaign with a small investment to see how your customers or target audience responds to them. Remember to always choose a promotional product that provides value to the recipient, represents your company well, and is easy to relate to. Great infographics among the content.